Some of my favorite tools and services have gone through some pretty big changes recently – enough so that felt it warranted a post just to point the changes out. The first three, Gmail, Evernote and TweetDeck, are tools I use every day to run my business. The last two, Yelp and Foursquare, are familiar rating and location tools that have morphed a bit to go after the lucrative local search market and deserve a good hard look from local small businesses. 1) User interface changes for Gmail – This is a pretty big change as far as I’m concerned and addresses a number of needed enhancements for handling mail. You can switch back and forth from the new view to the old by clicking on the new view link in the compose window. Composing Messages: One thing you may notice about the new interface is the way you compose a new message. 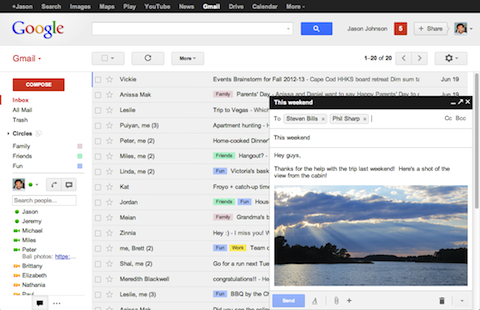 It looks similar to a Gmail chat window but a little bigger. This makes things simpler by allowing you to check old emails and saved drafts because you don’t have to leave the current page you are on to write a new email. Profile Pictures: It is now much easier to keep up with who is saying what within your email threads. Your contact profile pictures now show up within a conversation. Themes: New HD themes are now provided by iStockphoto. Simply choose the theme that suits you in preferences. Labels and Chat: These are constantly shown in the navigation panel on the left side. You can now customize that by size as well as completely hide your chat area. Search Box: Gmail’s new interface has incorporated a better search function allowing a drop-down advanced search box, which makes things much easier to locate. 2) Evernote 5 brings new look – probably the biggest news here is the totally overhauled and more visually appealing look of Evernote. Sidebar: The new Evernote 5 has implemented a left hand sidebar. With this sidebar comes a section for shortcuts that enable you to use a customized variety of notes, previous searches, tags and notebooks. Along with this you have the ability to view your tags, notebooks and latest notes. Notebooks: With the new changes you can now integrate your notebooks with shared notebooks that other people have allowed you to access. Note Editor: You will be able to see how many people have access to the same note you are viewing. You will see that at the very top of the note. There is also a function to shared notes updates, as they are integrated with Mountain Lion’s Notification Center. This is helpful so it won’t overwhelm you as they come in. Atlas Function: Simple way to view and access your notes is using this function. It allows people to search for entries geographically. Card View: This will show you text notes and images in a thumbnail preview. Type-Ahead: This is a search field that finishes your inquiry with ideas from previous entries, to include saved searches, keywords, and related notebooks. You are also able to improve your searches in more detail with advanced options. 3) Tweetdeck get a long overdo facelift – Now that Twitter owns TweetDeck it has finally ushered in some enhancements. Twitter Cards: You can now embed a photo or other media into a tweet with the 2.1.0 version. This makes your twitter stream appealing and attractive. Font: From your settings pane, you can now change your font size. There are only three options: 13 pt.-Small, 14 pt.-Medium or 15 pt.-Large. Color Scheme: You now have a choice to change your colors to the white background which has dark gray text. The links, URLs, hash tags and twitter addresses are blue, making them much easier to see. 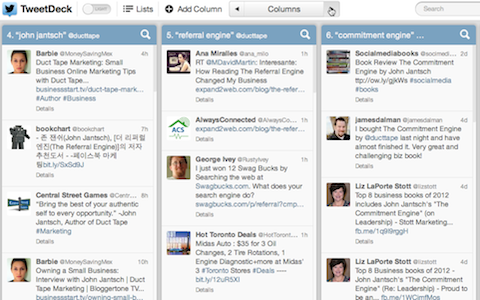 Columns: You are able to add a new column and check your twitter lists from the Tweetdeck toolbar. You can decide what you would like to incorporate into your columns, like a specific tweet stream from a particular group or person, or from one of your lists, or from a search. When adding a new column Tweetdeck will come up with suggestions for that particular subject, interactions, mentions and timeline. Shortcuts: The toolbar has many shortcuts to make things easier and simpler. For example, it has buttons that control the columns that will enable you to move through it seamlessly. You can also conduct a Twitter search and start a new tweet. When creating a new tweet you can add pictures and schedule that tweet for when you would like for it to go out or you can email that specific tweet. If you press ‘N’ on your keyboard you can instantly create a tweet. To send it, simply press “command” and “return” at the same time. The new business pages feature allows business owners to provide status updates, post deals, special promotions, photos, message and tips to the activity feeds of loyal or repeat customers who may be in the same vicinity. It automatically updates for those customers who are where the business is located. Additionally, when a customer searches for places in the Foursquare app or through the web, these important updates will show up in search results. The merchant dashboard has been redesigned to where merchants can manage updates more efficiently. This also allows SEO services, social media marketers and business owners to see data on businesses with numerous locations with improved analytics. 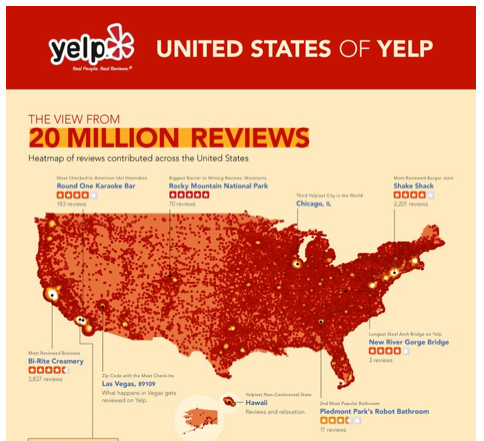 In 2012 Yelp and Bing partnered to bring Yelp’s local business content to the local search pages of Bing. With this partnership, Yelp is able to bring its photos, business qualities and reviews to Bing’s search engine with hopes of strengthening Microsoft’s attempts to be competitive with Google+ Local. Yelp listings are used in Apple’s Siri iPhone assistant, Yext listings and in the navigation systems in BMW, Mercedes and Lexus. Local small businesses have plenty of reasons to get more active with Yelp and other location based tools. 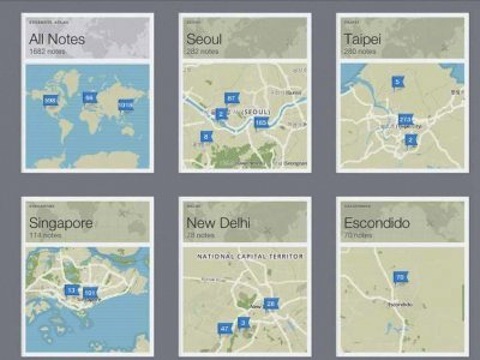 Facebook recently revamped it’s “nearby” feature that allows people to discover businesses based on location. One thing is certain – we live in a rapidly changing world of business and technology that calls for staying on top of a never-ending stream of new and emerging tools. But, hey, that’s what I’m here for!